> JETS - VIETNAM - KOREA - IRAQ - SYRIA - MODERN > Fist Full of Throttles by Mike Machat NEW! With World War II over and the world finally at peace, a new silent threat came into existence from a former U.S. ally, the Soviet Union. This new “Cold War” carried the spectre of nuclear global annihilation, as the world’s two superpowers developed countless new weapons of deterrence. 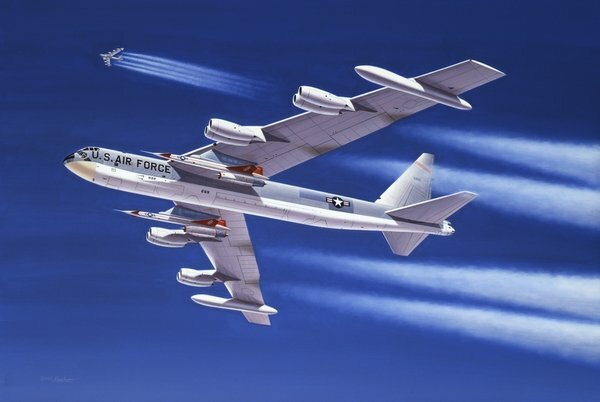 Perhaps the mightiest was the mammoth eight-engine Boeing B-52 Stratofortress, developed to deliver a nuclear strike anywhere in the world within hours. The B-52D shown here is carrying two Hound Dog cruise missiles to broaden its reach. Later versions of the Stratofortress are still flying today. Our Un-Stretched Option- When you purchase an un-stretched print from Plane Junkie you will get your image and a colored border surrounding the image. This colored border will enhance the image when it is stretched onto stretcher bars and will be seen on the edge in order to accent the printed image.